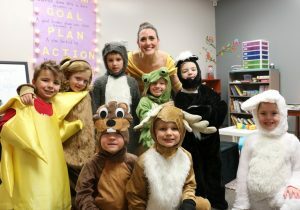 Franklin Covey Co. named Maple Grove Elementary a Leader in Me lighthouse school on March 28. Maple Grove was recognized because of the astounding impact the program has had on its students, staff and parents. The Leader in Me is a Nationwide whole-school transformation process teaching leadership and life skills on the basis that every student can be a leader. Through student empowerment and leadership opportunities, the students are taught to become thoughtful and helpful leaders in their school. The 7 Habits of Highly Effective People is a key component to the program. These seven habits act as character guidelines for the students. Maple Grove went above and beyond by turning the habits into mascots who visit their school with the Lady Leadership. Since the implementation of the Leader in Me program, Maple Grove has experienced increased attendance, decreased office referrals and an increase in academic achievement. Becoming a lighthouse school is a prestigious award given to only 200 schools out of the 3083 involved in the program by FranklinCovey. Maple Grove now joins Brookview Elementary who was the first Lighthouse school in the State of Iowa. To attain Lighthouse status a school must exhibit a leadership enforced environment through language emphasizing individual growth, integrated leadership language into classroom discussion, a system to track goals and more.